“Our no-nonsense instructors never give us a break. During rehearsals some of our girls stand there with small bits of paper in hand reading and memorizing the text,” military university cadet Yelizaveta Shcherbakova told Sputnik. When their gold braids are all in place, the girls put on mascara and white gloves. Still, no matter how impeccable they may look, their commanding officers always find a nit to pick. There were two female units, 200-strong each, taking part in the parade – four times more than last year. The women cadets’ parade uniforms are all custom tailored. During rehearsals their snow-white caps are wrapped in cellophane to keep them clean for the main May 9 march. As it turned out, with good reason. “This year’s weather has let us down with rain, snow and dust storms at the Alabino range where the wind was sending billows of sand 5 meters up and was literally blowing us away,” – unit commander Olesya Buka complained. 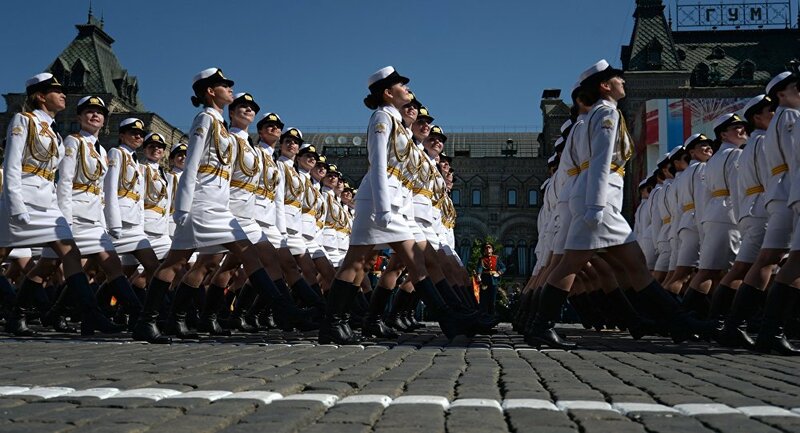 One in four female cadets of the Military University of the Russian Defense Ministry and the Volsky Military Institute of Material Security, who took part in the parade, has already been decorated for participating in last year’s Red Square march. The rest will soon receive their share of commemorative medals, which they will be proud of for the rest of their lives. The May 9 Victory Day parade, which takes place every year in Moscow and in all other major cities across Russia, celebrates the day the Soviet Army triumphed over Nazi Germany in World War II.